I came across a very cool Flash application last week that was developed by the New York Times. The app displays Netflix rental data on a heat map to show regional preferences in movie rentals from 2009 data. My first reaction was: Wait, the NY Times is actually developing innovative rich internet applications? Once I took time to mess around with the settings I became impressed with the level of effort put forth by a newspaper website. You can browse 10 different regions across the country and highlight different zip codes to see what the top movie rentals are in a specific zone. What immediately becomes apparent when looking at the DC map is the regional split in movie taste based on the breakdown of race in the Metro area. While popular movies like The Curious Case of Benjamin Button were rented frequently across the entire area, other movies like Obsessed (with Beyonce) and the Tyler Perry family of movies that target more of an African American audience show rental surges in Prince Georges County and areas of southeast DC. 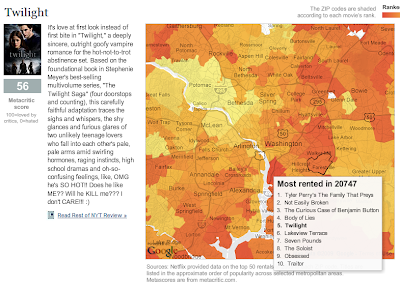 These movies show nearly no rental usage in Northern Virginia or Montgomery County. Alternatively, The Reader (a so-so Oscar nominated film from 2008 with Kate Winslet) was rented primarily in Northern Virginia and the northwest suburbs of Maryland but not in PG County. It's interesting to see how rental preferences can differ greatly in such a small regional sample. This is a good example of clever developers putting publicly available API feeds to good use. It would be nice to see Netflix adopt this type of geographic rental representation on their own site. Go ahead and play around with the Netflix map yourself at the NY Times site. They must have missed the constant inflow of Tyler Perry movies to Klimmer's house in Tyson's Corner.